Firstly typing in caps is considered shouting - not very considerate. On most semis the ceiling joists run front to back. 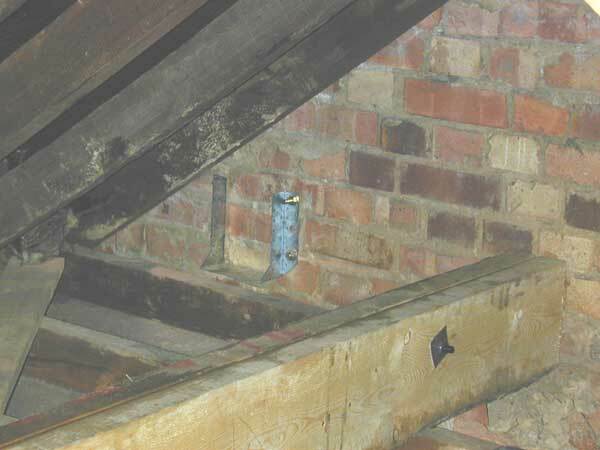 If yours do and you run your new floor joists from hipped end to party wall they will be above the existing ceiling joists and will markedly reduce the available height/space. Also with this span you're going to need pretty big joists and I'd have doubts as to how you'd support them at the hipped end. If you're going to do it, do it properly. Paying someone who is familiar with loft conversions and can produce a design that works and complies with the regs will be money well spent. As Tony said, if your existing loft beams run the other way you may lose too much headroom. If you do need to fix a beam to the party wall then a heavy shoe of a type designed to be bolted to a flat surface is the sort of thing you would require. Note that these are not as easy to find as the more usual timber to timber hangers, or the ones designed to be built in to brickwork. The floor will still need to comply with the same building regulations, so the actual use does not make that much difference from a strength point of view. You will also need to check out the law relating to party walls as well as getting building regulations approval before you start work. Failure to do so will make your house difficult if not impossible to sell in the future. Take a look here for more details. I THINK YOU SHOULD LEAVE WELL ALONE, MEE' SON. AS YOU DON'T SEEM TO KNOW WHAT THE HELL YOU'RE ON ABOUT. A loft conversion needs planning permission, ALL OF THEM, not just yours. Kids playing in a room that is a fire hazard is also a NO NO !!! What plans for them to escape have you made? How will you stop a fire reaching them in the hottest part of the house, especially in a fire? What lighting and power pints are you putting in it? Will there be natural light from a roof window? If so, what type of window are you installing? Don't be stupid man please!!! Make proper plans for this, and get real professional advice from a structural engineer or architect, before you go knocking your, or someone else's, house down. No, it needs Building Regulations approval. It might just need planning permission, but lots don't. In fact (contrary to common opinion) most do *not* need PP. Typically a "full plans submission" to building control with structural calculations for critical items like the floor design is more than adequate. You may be able to do it on a building notice and supply the calcs later. You are only likely to need PP if you are changing the front aspect of the property (i.e. adding a front dormer). Note that a hipped roof to gable end conversion is oddly not considered to be changing the front aspect. You will also highly likely to need PP if the building is in a conservation area, or is listed. Most of this is covered by building regs. None of the rooms should be fire hazards if done right. The fire regs will require that there is a means of escape window (one that is big enough and low enough to climb out off) from each habitable room (i.e. not bathroom). This can be a Velux style roof window. The new habitable rooms will require 30 min fire doors. If the building is now over two storeys then mains powered and interlinked smoke detectors on each floor. Existing doors that open onto the exit route need to be made self closing (unless the stairs are separate/enclosed). The ceiling under the new floor will need to be at least 12mm PB with skim, or, extra rockwool or similar can be added into the new floor to enhance fire break performance). Building regs may require that at least one of the new light fittings is of a type that will only accept "low energy" bulbs. No particular requirements on power, other than fit what you think you need and what is sensible. There will be a MoE window, but type is not that important from a regulation point of view. Again choose whatever seems right. It is possible to DIY with a bit of care and attention to detail. Just needs some research first. The important thing about the smoke detectors are that they are linked, mains is (or was) only recommended (I have linked battery ones). The MoE window(s) needs to be in a place where a ladder can be carried to it from the road side - it does not actually have to be on the road side itself (although in many cases it will be obviously). So a loft conversion with two habitable rooms can have MoE windows to front and rear. Yes, that is probably more accurately phrased than what I said. The MOE window does not have to accessed from the road side. It only needs to be accessible from a flat area (e.g. a path) where a ladder can be used safely, and also where the ladder can be carried to. In my case this is at the rear of the property and would mean carrying it through a narrow shared passageway, but building control said that the fire service would proabley go over the fence (or though it!) from the other side of my property where their is an adjacent driveway. You can't use an exit which alights onto say a flat roof area etc. Someone else has already posted that this needs to be accessable from a ladder (which makes perfect sense). We have a conservatory the full width of the back of our house so I assume that this would mean an escape window in the front? Ah. Thats promising. I was imagining that we would need new ceilings in all the bedrooms - something I would again rather avoid if there is another option. I'm not interested in bodging it and def want something that is upto (or exceeds) fire regs. I would be happy to spend a bit more to minimise disruption to the rest of the house though! Probably. You can get MoE velux style windows however. You can have a MoE window over a single storey extension, but the roof of it needs to be something non combustible that you could make an escape over, and/or put a ladder on if needs be. Most conservatories will not meet these criteria. Generally the exiting doors made self closing are fine. Even a lightweight "eggbox" door will buy you extra minutes to escape in if it is shut. You may find there are specific requirements however if the existing doors are partly glazed. The original plans for ours commented that ceilings ought to be 12mm and skim, and if not then add 100mm of rockwool suspended on chicken wire between the new floor joists. As it happened we had 9mm PB + skim ceilings so this was necessary. The BCO did also comment that they may have required the insulation under the floor anyway to meet the new noise transmission requirements. Apart from being a right pain to do, I was in principle happy enough to do it since I was quite keen on the extra noise insulation anyway - never mind the fire regs! cold bridges how to minimize them?